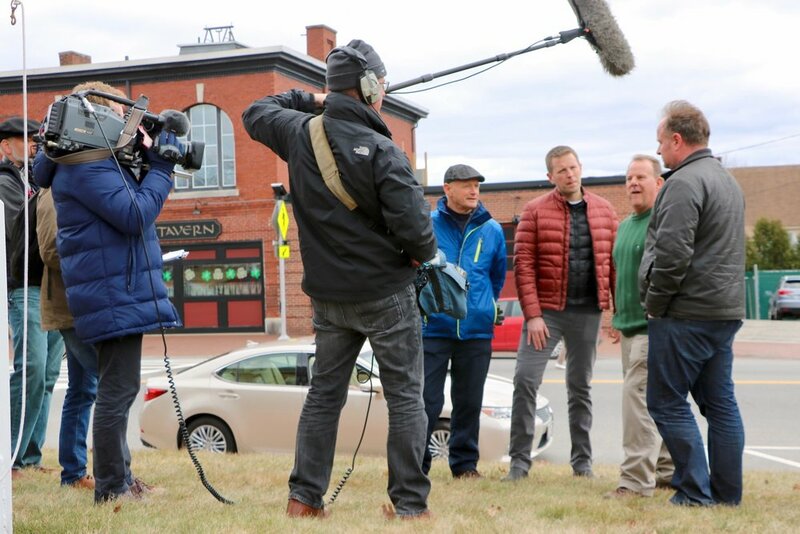 Leaving Dublin just before a rare snowstorm shut the city down, a team from [Waddell Media] in Belfast arrived in Boston recently for a four-day filming adventure. Alan and Ainsley Laughlin, descendants of Rev. MacGregor’s brother Andrew. Colin Brooks, American genealogist and contributor to the 1718 Migration Project. Their purpose was to shoot footage for a BBC Northern Ireland “discovering genealogy” type television show called Family Footsteps. They came with two descendants of The Rev. James MacGregor, who in 1719 led 16 Scots-Irish families from Ulster to eventually settle in Nutfield, today’s towns of Derry, Londonderry, Windham, and the Derryfield part of Manchester, New Hampshire. 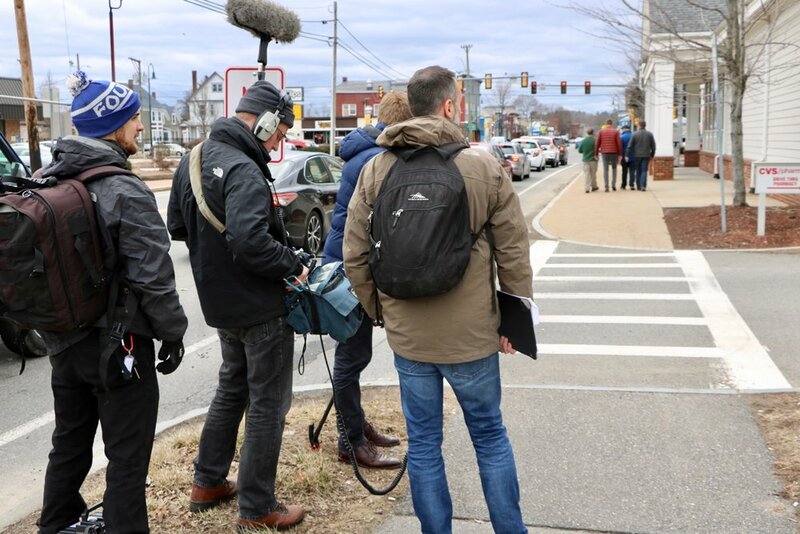 On Friday March 2nd, 2018, the team traveled to Casco Bay in Maine for a firsthand experience of the tough winter conditions part of Rev. MacGregor’s party endured as their ship was stuck frozen in the bay for the winter of 1718–1719. On Sunday March 4th, they traveled to The Fort at Number 4 on the Connecticut River in Charlestown, New Hampshire, to get a taste of the First Settlers’ daily life in a recreated colonial village and open-air museum. Saturday March 3rd and Monday March 5th they spent mostly in Derry. 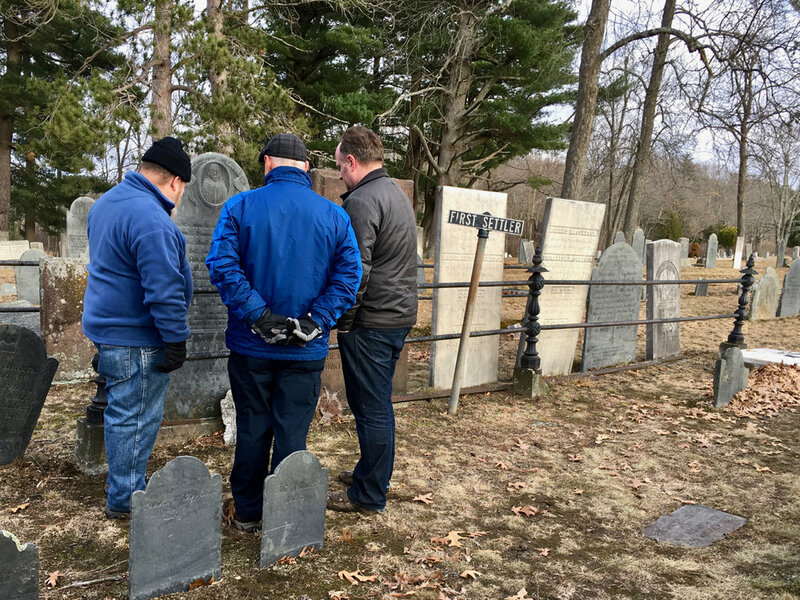 Their visit was coordinated by folks from the Derry Heritage Commission, the First Parish Church Historic Preservation Committee and Building Advisory Committee, Nutfield Geneology, and the Friends of the Meetinghouse at First Parish. 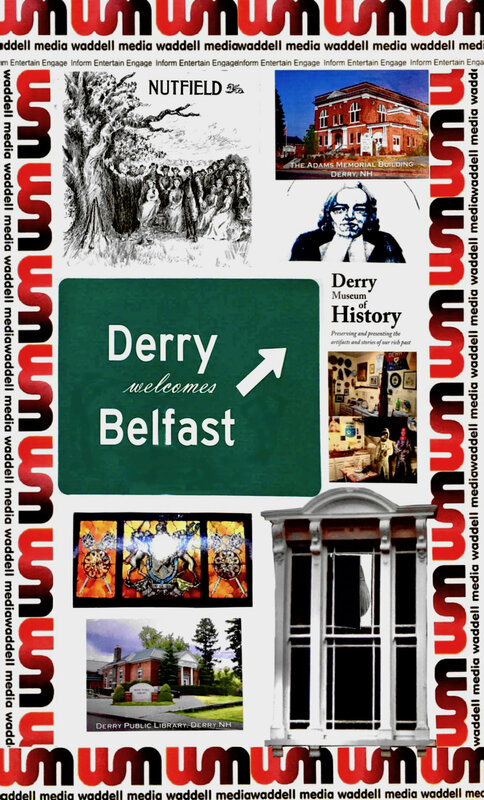 Some Derry scenes and details follow. 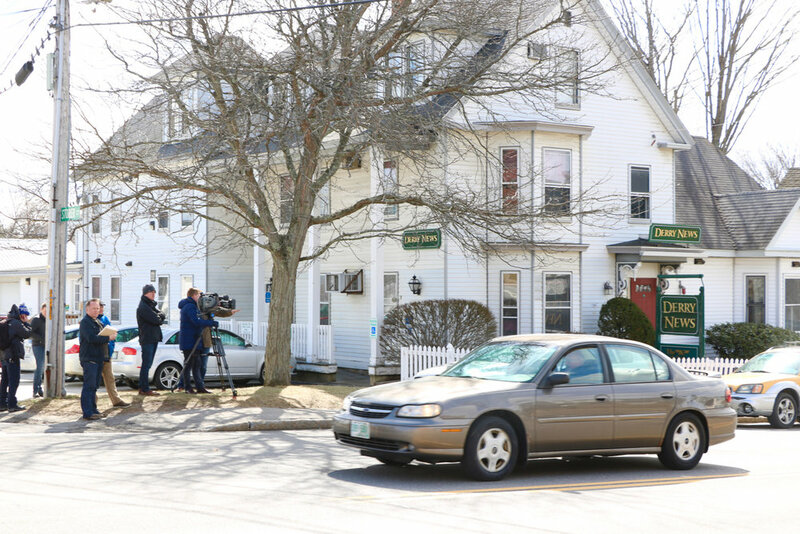 In addition to visiting historic and MacGregor-related sites, the producers wanted to capture a sense of MacGregor’s town as it is today. They arrived about 11:00 am at the Derry Public Library, site of the later MacGregor reunion luncheon. 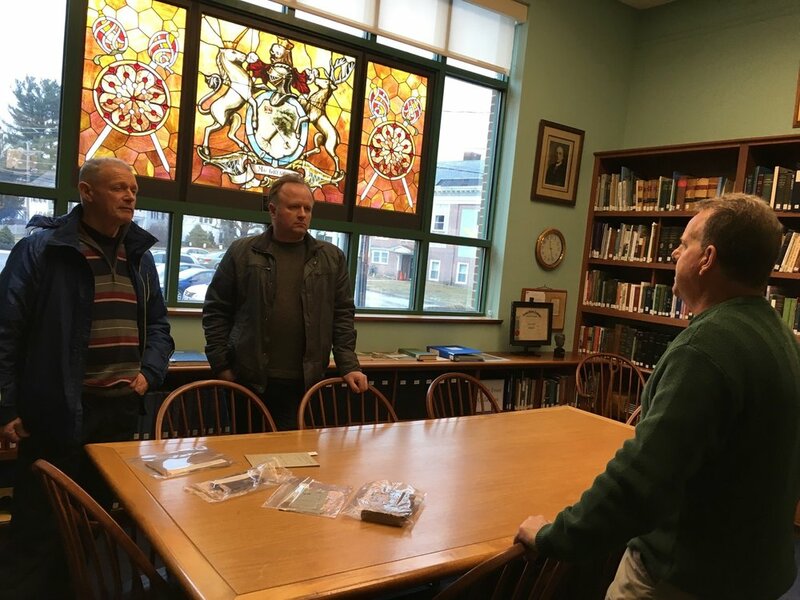 While the crew set up lighting and equipment in the lower level function room, their historian for this trip Colin Brooks talked with descendants Alan and Ainsley Laughlin upstairs in the New Hampshire Room. This special research room is filled with historic resources and features a stained glass window with the MacGregor family coat of arms. 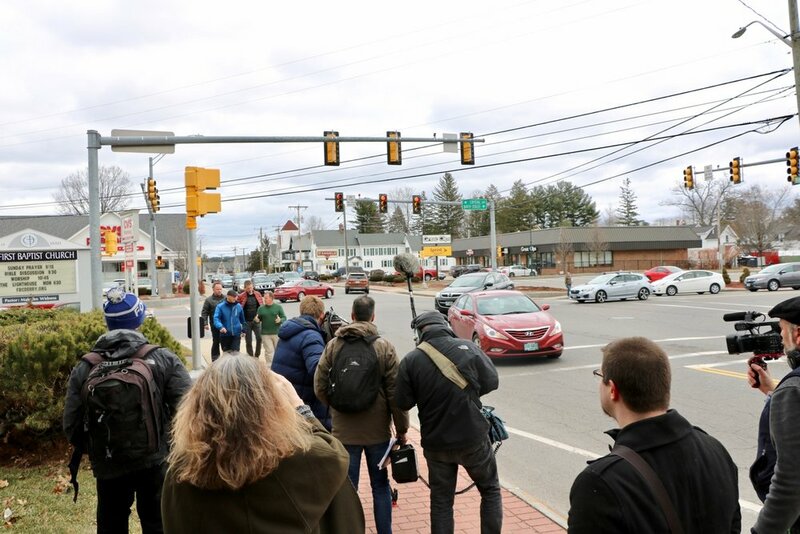 The team then walked west on Broadway from the library to the Derry Museum of History in the Adams Memorial Building, stopping at corners and intersections to film and accompanied by reporters and photographers from local newspapers and a videographer from Derry Community Cable. After an extended discussion filmed on the lawn and a quick visit in the History Museum, everyone rushed by car back to the Library. 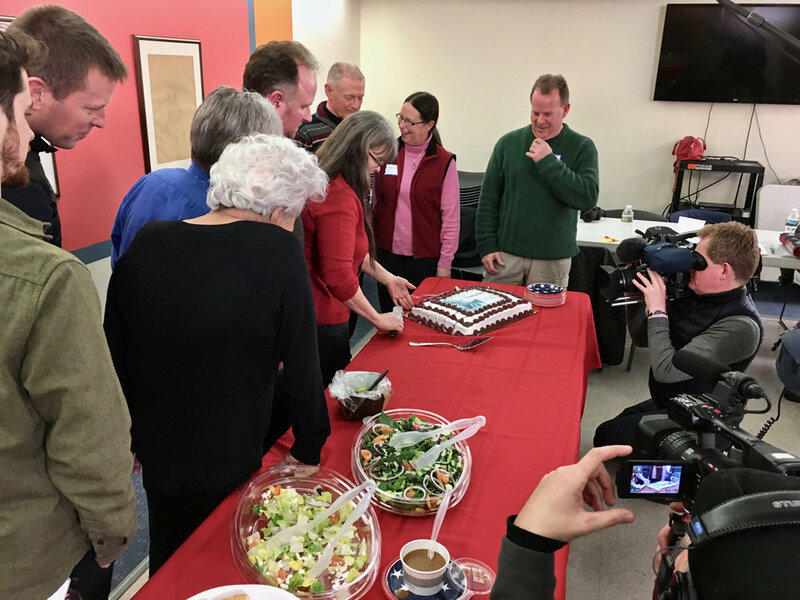 While Alan, Ainsley, and Colin returned to the New Hampshire Room, the final preparations for the surprise reunion luncheon were made in the library’s great function room downstairs. Alan and Ainsley were quite moved by the gathering, and the chance to meet relatives they had not previously known about. The festivities even included a FaceTime session back home to Northern Ireland so Ainsley’s life and children could participate. After the wonderful reunion lunch, the crew raced up to Forest Hill Cemetery in East Derry, very conscious of the cloudy conditions and risk of loosing the light for the remaining outdoor filming. They arrived about 3:30 pm. 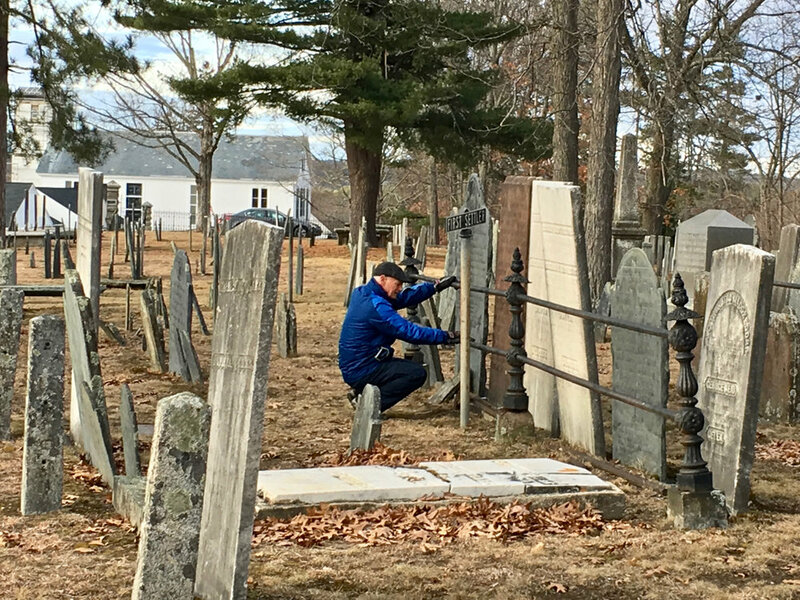 After considerable filming in the cemetery, the crew moved on to the site of the First Sermon on the shore of Beaver Lake, getting there only a bit late at about 4:30 pm. We are grateful to the property owner and residents for allowing access to this private location on the northeast shore of the Lake. This was the site where Rev. MacGregor first gathered the initial settlers for an encouraging sermon as their work to establish a life at Nutfield was about to begin. 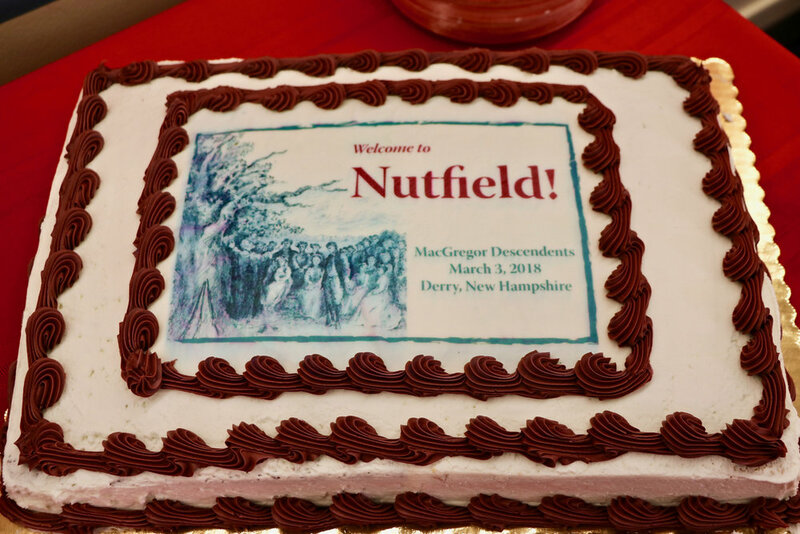 We consider its date, April 12, 1719, to be the founding date for Nutfield. After capturing some beautiful, contemplative scenes as the sun lowered on the lake, the crew packed up and concluded a long but successful day. 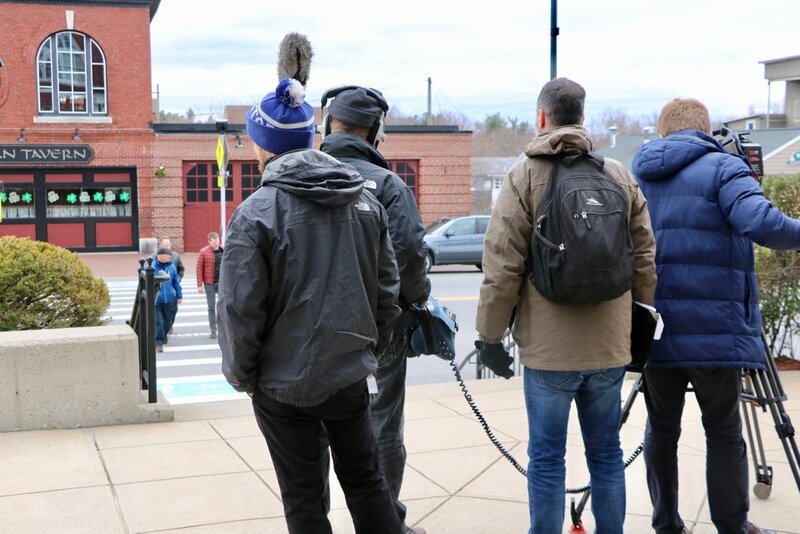 With the snow cleared in Dublin and a 6:30 pm Logan Airport flight home, the crew made time Monday morning March 5th to do more filming in Derry. 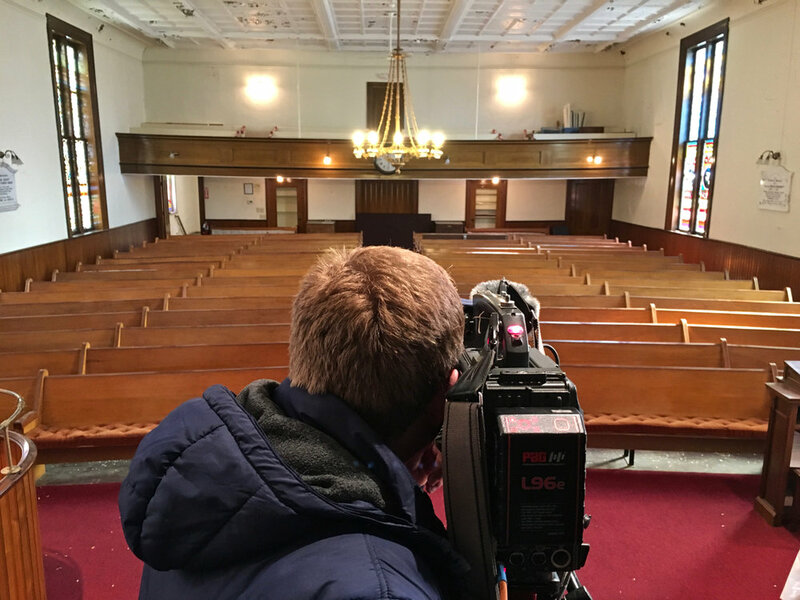 The film crew meanwhile visited the Meetinghouse at First Parish. Our Northern Ireland visitors concluded their successful trip with some final shooting and a late lunch downtown before heading to the airport in Boston. Everyone involved in hosting was moved by meeting the Alan and Ainsley, and the weekend was an encouraging boost to our plans for the Nutfield 300th Celebration in 2019. In fact, hearing of those summer-long plans, the Laughlins—and the Wadell Media team—will try to come back and participate in the big kick off at First Parish and downtown on April 12, 2019. Please fill out this form to email us. Thanks! Nutfield History by Paul Lindemann is licensed under a Creative Commons Attribution-NonCommercial-ShareAlike 4.0 International License. We will eventually have an email newsletter with occasional news and updates. We respect your privacy and will only use this info for your newsletter subscription. Thank you! Not sure when we'll get the newsletter going, but you're now on the list!